In 1912, when the Republicans renominated Taft, Roosevelt bolted the party to lead the Progressives, thus guaranteeing the election of the Democraft, Woodrow Wilson. Nominated for President at the 1912 Democratic Convention, Wilson campaigned on a program called the New Freedom, which stressed individualism and states' rights. In the three-way election he received only 42 percent of the popular vote but an overwhelming electoral vote. High tariffs were a means not only of protecting infant industries, but of generating revenue for the federal government. They were also a mainstay of the Republican Party, which dominated the Washington political scene after the Civil War. After the Democrats, who supported freer trade, captured Congress and the White House in the elections of 1910 and 1912, the stage was set for a change in tariff policy. With the 1913 Underwood-Simmons Tariff, the United States broke with its tradition of protectionism, enacting legislation that lowered tariffs (and also instituted an income tax). Presidents Woodrow Wilson (1913-1921) and Theodore Roosevelt (1901-1909) shared similarly expansive views of America's interests in the world, marked by a belief that the United States' fortunes were inextricably linked with the character and conduct of nations across the globe. Wilson had seen the frightfulness of war. He was born in Virginia in 1856, the son of a Presbyterian minister who during the Civil War was a pastor in Augusta, Georgia, and during Reconstruction a professor in the charred city of Columbia, South Carolina. Wilson maneuvered through Congress several major pieces of legislation. The first was a lower tariff, the Underwood Act; attached to the measure was a graduated Federal income tax. The passage of the Federal Reserve Act provided the Nation with the more elastic money supply it badly needed. In 1914 antitrust legislation established a Federal Trade Commission to prohibit unfair business practices. Another burst of legislation followed in 1916. One new law prohibited child labor; another limited railroad workers to an eight-hour day. By virtue of this legislation and the slogan "he kept us out of war," Wilson narrowly won re-election. But after the election Wilson concluded that America could not remain neutral in the World War. On April 2,1917, he asked Congress for a declaration of war on Germany. Massive American effort slowly tipped the balance in favor of the Allies. 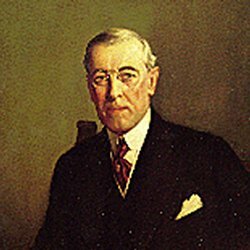 Wilson went before Congress in January 1918, to enunciate American war aims--the Fourteen Points, the last of which would establish "A general association of nations...affording mutual guarantees of political independence and territorial integrity to great and small states alike." Woodrow Wilson did not share Taft's strict constructionist perspective of executive powers. More important, the new chief executive believed the obligations of his nation extended far beyond its boundaries. He declared: "We are, in spite of ourselves, the guardians of order and justice and decency on this Continent. We are, providentially, naturally, and unescapably charged with the maintenance of humanity's interest here." While Taft had acted as the watchful steward concerned primarily with matters inside the territorial limits of his own nation, Wilson stood as the stern archangel with mighty and righteous impulses to be exercised beyond the national boundaries. After the Germans signed the Armistice in November 1918, Wilson went to Paris to try to build an enduring peace. He later presented to the Senate the Versailles Treaty, containing the Covenant of the League of Nations. But the election of 1918 had shifted the balance in Congress to the Republicans. By seven votes the Versailles Treaty failed in the Senate. The President, against the warnings of his doctors, had made a national tour to mobilize public sentiment for the treaty. Exhausted, he suffered a stroke and nearly died. Josephus Daniels was Secretary of the Navy (1913-1921) under President Wilson. Daniels reformed policies by introducing schooling for illiterate sailors, instituting vocational training, opening the Naval Academy to enlisted men, and reforming the naval prison system. Daniels remained through Wilson's second term to lead the Navy through World War I with a young New Yorker named Franklin D. Roosevelt as his Assistant Secretary. Replacement ships for the Indiana, Ortgon, and Massachusttts should have been laid down in 1910, for the Iowa in 1912, and new replacement ships should be begun for the Kentucky and Kearsarge in 1915. These matters, together with the shortage of 3 battleships already existing in 1911, were taken into consideration by the General Board in making its recommendations for a 4-battleship program in both 1912 and 1913. One battleship only was provided for in each of these two years, increasing the shortage in the original 48 battleship program to 5, without considering replacement ships for the Indiana, Oregon, Massachusetts, and Iowa, already overdue for authorization. On December 1, 1913, Josephus Daniels filed his first annual report as Secretary of the Navy and in it he recommended the construction of 2 battleships, 8 destroyers, and 3 submarines. The General Board advocated a program about the same as it had urged for the five preceding years. Inasmuch as the Secretary's recommendations differed from those of the board, he considered it proper to make public not only the recommendations of the General Board but its views concerning the conditions which led to the conclusions embodied in the recommendations. The General Board had every year, since 1903, recommended, after careful study, the building program it considered necessary for the proper growth and proportion of ships for the Navy, but it seems that in no instance was the report of the board made public, that frequently its recommendations and always its analyses of the situations had been held as confidential by the Navy Department. It had "not been furnished to the Committees of Congress on Naval Affairs. Hon. Thomas S. Butler, of Pennsylvania, the oldest member in point of service, stated during hearings before the House Committee on Naval Affairs: "Permit me to say, Mr. Secretary, that I have sat on this side of the table In this committee for 18 years and I have been in the dark for 18 years " ; and Hon. Ernest W. Roberts stated during the same discussion : "I recall very well sitting here when Secretary Moody came before us and placed before us the plan adopted by the General Board, which, he stated at that time, was to be regarded as a naval secret. Some years we never did see it. I will be frank to say that in the 14 or 15 years I have been on the committee I have never seen the complete report of the General Board until your report last year and this year. What we have had Is the building program. Just enumerating the units and classes. That has been given to us a number of times and that is why I am so interested to know how much importance we can attach to this report of the General Board now that we have it." The 1913 naval appropriation bill authorized the construction of 2 dreadnoughts, 6 destroyers, 8 or more submarines, and 1 submarine-testing dock, so that in this one year, the authorization of 2 new dreadnoughts and the replacement of the pre-dreadnoughts Mississippi and Idaho by a later type of ship, 3 modern dreadnoughts "carrying as heavy armor and as powerful firmament as any vessel of their class," were assured to the Navy. This bill was characterized also by the appropriation of a lump sum for the construction of submarines, the only restriction being that at least 8 such vessels be built; end the department was thereby enabled to contract for the construction of 7 coast-defense submarines, and for a new type of submersible, commonly known as a sea-going or licet submarine, a vessel of over 1,000 tons, the first of its type to be constructed by any nation of the world. In 1914, as in the preceding year, the Navy Secretary's annual report included the complete recommendations of the General Board concerning the new construction deemed by the board advisable. Its program was in most respects a duplicate of those which the board had made for the preceding five years, except that a specific appropriation for air service was recommended, and for the first time the seagoing submarine is mentioned in the report of the General Board. Navy Secretary Daniels renewed the recommendations of the preceding year for two dreadnoughts and six destroyers, and submitted a further recommendation for a gunboat, an oiler, and eight or more submarines, at least one of which should be of the seagoing type. The outbreak of war in Europe in July of 1914 set in motion a series of events in America. President Woodrow Wilson signed a Proclamation of Neutrality on August 5, 1914. From the beginning of the European war there was persistent agitation carried on both by public officials and private citizens to bring the navy of the United States into a condition of effectiveness on the light of possible complications arising from the war. As it was generally admitted that the navy in the case of foreign war would be the chief line of defence, the discussion in regard to that branch of the service was even more aggressive than that relating to the army. Differences of opinion arose between Secretary Daniels and naval officers as to the real condition of the naval forces. Assertions were made that the navy was undermanned, that but few of the larger ships were in condition for actual warfare, that the submarines were, with one or two exceptions, useless, and that there were many other defects in the navy which would seriously prevent its doing effective service in the case of war. Congress signalized its appreciation of the needs of the Navy by passing the largest naval appropriation bill recorded in American history, and by restricting disbursements ashore, to the exclusion of all unimportant military works, the largest possible sum was applied to the development of the Navy afloat. This policy enabled the authorization of 2 battleships, 6 destroyers, 1 fuel ship, 16 coast-defense submarines, 2 seagoing submarines, and $1,000,000 for air craft. When the Sixty-third Congress, which voted more money to naval increase than any of its predecessors, authorized the construction of 5 dreadnoughts, 12 destroyers, and 26 submarines, 3 to be larger than any nation had constructed, it made appropriations only for about one-third of the amount it will cost to build the craft authorized. The Sixty-fourth Congress was to make appropriations to continue their construction. Such binding of one Congress by another (if it can be called binding) is necessary in the building of modern warships, for they are so large and costly that it requires 34 months to build a fifteen-million-dollar dreadnought, and two years to build destroyers and submarines. Strained relations with Germany caused the United States to enter upon a course of great naval expansion in 1916-17, which led to a considerable increase in expenditure, due mainly to the adoption for the first time of a continuous shipbuilding program. The period was of three years, the total cost to be approximately $520,000,000, and in the first year four battleships, four battle-cruisers, four scout cruisers, 30 submarines and 20 destroyers were laid down, to be followed by six additional battleships, two battle-cruisers and a number of smaller vessels. With the declaration of war the program was enormously increased and accelerated; at the opening of hostilities the navy had 787 vessels of all kinds, including a large number of submarine chasers. Prior to the Great War, the Navy focused on a creating a fleet ? second to none - meaning a fleet equal to that of the greatest naval power in the world -- that of Great Britain. This building program, drawn up in 1915 and submitted in 1916, outlined how the Navy would build its fleet to equal that of Great Britain by 1924. Although this program called for appropriations at the rate of two capital ships per year, along with auxiliary ships, the Great War intervened and forced the battle ship building program to fall behind, while significantly increasing both the destroyer and submarine building programs. In 1921, the General Board again advocated carrying out the 1916 program. Every year, the Board would submit, to Congress through, and directed by, the Secretary of the Navy (SecNav), the Naval Policy and Ship Building Programs for the next few years. In July 1921, the Board submitted the program to Congress, stressing the needs of the Navy to continue to build all types of ships in order to bargain from a position of strength. In his Third Annual Address Delivered At a Joint Session Of The Two Houses Of Congress, December 7, 1915, President Woodrow Wilson called for a program for the construction within five years of ten battleships, six battle cruisers, ten scout cruisers, fifty destroyers, fifteen fleet submarines, eighty-five coast submarines, four gunboats, one hospital ship, two ammunition ships, two fuel oil ships, and one repair ship. It is proposed that of this number the first year would provide for the construction of two battleships, two battle cruisers, three scout cruisers, fifteen destroyers, five fleet submarines, twenty-five coast submarines, two gunboats, and one hospital ship; the second year, two battleships, one scout cruiser, ten destroyers, four fleet submarines, fifteen coast submarines, one gunboat, and one fuel oil ship; the third year, two battleships, one battle cruiser, two scout cruisers, five destroyers, two fleet submarines, and fifteen coast submarines; the fourth year, two battleships, two battle cruisers, two scout cruisers, ten destroyers, two fleet submarines, fifteen coast submarines, one ammunition ship, and one fuel oil ship; and the fifth year, two battleships, one battle cruiser, two scout cruisers, ten destroyers, two fleet submarines, fifteen coast submarines, one gunboat, one ammunition ship, and one repair ship. If this full program should be carried out the US would have built or be building in 1921, according to the estimates of standards of classification followed by the General Board of the Department, an effective navy consisting of twenty-seven battleships of the first line, six battle cruisers, twenty-five battleships of the second line, ten armored cruisers, thirteen scout cruisers, five first-class cruisers, three second-class cruisers, ten third-class cruisers, 108 destroyers, eighteen fleet submarines, 157 coast submarines, six monitors, twenty gunboats, four supply ships, fifteen fuel ships, four transports, three tenders to torpedo vessels, eight vessels of special types, and two ammunition ships. President Wilson said "This would be a navy fitted to our needs and worthy of our traditions." The President on his Western tour advocated for the United States a navy second to none. "There is no navy in the world that has so great an area of defense as the American Navy, and it ought to be incomparably the greatest navy in the world." When the President made this statement there was no plan before Congress, even in the future, for a navy to equal England's. In the Annual Report of the Secretary of the Navy, submitted to Congress on December 7, 1915, for the first time in the report of a Secretary of the Navy, a plan was submitted which covers not only the necessities of the immediate future, but was extended to cover a period of five years. Thorough consideration of the present and future requirements of the service has led to the recommendation of the five-year program. The adoption of a continuing program by the executive department of the Government is a distinct Innovation. No previous administration had espoused a program looking to meet the needs of the service beyond the current year. In 1903, the General Board of the Navy, in its confidential report to the Secretary of the Navy, recommended a continuous building program, but no Secretary of the Navy urged its adoption. Indeed, up to December, 1913, when Navy Secretary Josephus Daniels printed the full report of the General Board as an appendix to the Secretary's Report, neither the members of Congress nor the public had access to the recommendations of that board of naval statesmen. Their report was a sealed book. The Secretary of the Navy's recommendation of a five-year program embraced the same number as proposed by the General Board in the distribution it made in the five-year program of dreadnoughts, battle cruisers, scouts, and destroyers. I recommend 15 fleet submarines where the General Board recommended 9, and Daniels recommend 85 coast submarines as against 58 recommended by the General Board. The Secretary's total for the five years was $502,482,214. The General Board's total is $499,876,000, a very slight difference for the five years, though the board's recommendation for the first year was much larger than the department's estimate. The recommendation for a five-year program of new construction, called for $100,000,000 a year for five years, depended on congressional approval. The estimates for the next fiscal year embrace the increased appropriations which must be made by the first session of the Sixty-fourth Congress if it approves the new construction recommended for the first year of the program, and also the increased cost for additional personnel and the items necessary for the pay of the Naval Establishment. For the coming year $28,369,127 was recommended to continue the ships authorized by the Sixty-third Congress and $57,003,000 to begin the work on the new construction which it was hoped this Congress will authorize. This made $85,372,127. They may be reduced if it is decided to continue to build dreadnoughts of substantially the California type instead of going to the construction of the much larger superdreadnoughts suggested by the General Board. As regards the battleships included in the program, the characteristics recommended for them by the General Board involved a very material increase in displacement over previous battleships, which were themselves larger than those built or building by any other nation. While allowing in the program the estimated cost of these enormous vessels, the department had not finally approved them. As a definite determination of their exact characteristics was not necessary at that time. Admiral Benson, the first Chief of Naval Operations, thought that the Naval Act of 1916 had to be carried out as a long-term project not connected to the war itself. After the Armistice, the Navy urged Congress to resume funding of the Naval Act of 1916, which had been suspended during the war so that ships to combat German U-boats. During the First World War but prior to America's entry Congress had passed the Naval Act of 1916 authorizing (but not appropriating funds for) a massive buildup of the fleet to create "a navy second to none" in the world. With the Naval Act of 1916 the Congress authorized $500 million for a three year program which aimed to build the Navy to be the equal of any navy in the world. On 29 August 1916 Congress approved President Woodrow Wilson's request for to build a navy equal to any in the world. The Naval Act of 1916 authorized 50 destroyers built over a three year period. For the navy the plans called for the expenditure of more than $500,000,000 on 157 new war vessels of various types. The naval increase were over three years. The new units for the navy to be begun within three years, including those authorized to be begun at once, were 10 battleships, 6 battle cruisers, 10 scout cruisers, 50 destroyers, 9 fleet submarines, 58 coast defense submarines, 1 special type submarine, 3 fuel ships, 1 repair ship, 1 transport, 1 hospital ship, 2 destroyer tenders, 1 fleet submarine tender, 2 ammunition ships, and 2 gunboats. Sixty-six of these were authorized by the Naval Act of 1916. The Secretary of the Navy had planned a program which was intended to cover not only the necessities of the immediate future, but was extended to cover a period of five years. The Sixty-third Congress, which appropriated more money to naval increase than any of its predecessors, authorized the construction of five dreadnoughts, twelve destroyers, and twenty-six submarines - three of the latter to be larger than any nation had heretofore constructed. Appropriations, however, were made only for about one-third of the amount that would defray the building of the vessels authorized. It was necessary, therefore, for the Sixty-third Congress to make appropriations to continue the construction. In May 1916 the Naval Appropriations Bill was introduced in the House. Secretary Daniels placed a special emphasis on the necessity for building battle cruisers. He declared that in every naval event of consequence which had occurred in the North Sea area during the first two years of the European war the leading parts have been taken by cruisers and vessels of the scout type. The first item in the new navy program was an estimate of $276,470,000 as the first year's appropriation for hulls and machinery of two battleships, two battle cruisers, three scout cruisers, fifteen destroyers, two gunboats, one hospital ship, and one fuel ship. The appropriations made for similar vessels in 1914 was $7,200,000. For the hulls and outfits of five fleet and twenty-five gunboats $7,675,000 was asked. For armor and armament of vessels authorized the estimate of $21,681,000, compared with $9,577,998 in 1914. For aviation $2,000,000 was asked for, and for reserve ammunition $8,000,000. For the proposed experimental laboratory $1,000,000 was provided. For fortification at the Panama Canal, $5,600,000. In addition to Secretary Daniels' program Congress had two others to consider. The first was a report of the General Board of the Navy made on July 30, which recommended a navy "second to none" by 1925. The second was another report made by the General Board on how best to spend $500,000,000 on new naval construction in the next five years. Third, a plan prepared by the administration for spending $502,000,000 on the increase in the navy during the next five years. When war was declared on Germany in April 1917 the tonnage of the United States navy, including all types of vessels then under naval control, was approximately 1,500,000. The total appropriated for the naval establishment for the year 1917 was $12,700,555.84. This means that the estimates submitted today for time naval establishment are $66,451,146.23 greater than the naval apppriration for 1917. For the continuation of work on war vessels that had been heretofore authorized, including the sixty-six units authorized on August 29, 1916, the naval estimates called for an appropriation of $118,946,155. In addition, the naval estimates called for an appropriation of $96,962,200 for the proposed building program of 1918, which embraced forty-two units. These units were three dreadnought battleships, one battle cruiser, three scout cruisers, fifteen destroyers, four fleet submarines, fourteen coast submarines, one destroyer tender, one fleet submarine tender. These vessels were all in addition to those authorized in the Naval Act of 29 August 1916 to be begun within six months and represented the second annual increment in the three-year program. The sum of $118,96,155 asked for continuation of work on vessels already authorized, and of $96,962.200 for the first year of work on the proposed naval program of 1918, meant that the total amount asked for the increase of the navy in the estimates submitted 05 December 1916 was $215,908,355 out of a grand total of $379,151,701 for the naval establishment. The Secretary of the Navy on 9 Dec. 1917, in his annual report, asked for $1,000,000,000 for his department for the next fiscal year. The personnel of the navy was at the same time increased from 19,500 to 322,000; the naval reserves from a few hundred to 49,000; the monthly expenditure from $8,000,000 to $60,000,000, and ships in commission from 300 to over 1,000. For the 1918 naval building, Congress was asked to make appropriations for three battleships, one battle cruiser, three scout cruisers, fifteen destroyers, one submarine tender, and one destroyer tender. After April, 1917, construction of battleships was suspended in favor of destroyers and other urgently-needed antisubmarine ves-sels, but the U.S. Navy (USN) nevertheless finished the war with a battle fleet nearly as large as Britain's and more modern. It also had a considerable force of destroyers, although no modern cruisers. In 1919 a new three-year building program was laid before Congress. It called for 10 battleships, six battle-cruisers, 10 scout- cruisers and 130 destroyers, submarines, etc. At the close of the European War the navy had increased into a fighting organization of more than 2,400,000 tons, or, if transports under uaval control arc added, of well over 3,000,000 tons. In 1917 and 1918 three super-dreadnoughts, the largest afloat, were added; more than 100 destroyers were built; two super-dreadnoughts to be armed with 16-inch guns were completed in 1919, while five great battle-cruisers and a fleet of fast scout cruisers were being constructed. In 1919 also was inaugurated the policy of expanding the navy into two great fleets one in the Atlantic and the other in the Pacific. Each fleet contains two divisions of dreadnoughts, with two divisions of pre-dreadnoughts held in reserve in each ocean and about 100 destroyers. These fleets are brought together each year for joint battle exercises under a single command. The Panama Canal made possible the holding of joint maneuvers whenever they are necessary. In 1919 the new three-year program which Secretary Daniels recommended to Congress would place the American Navy, in the number and power of its effective fighting craft, ahead of Britain's, so far as capital ships - ships of the dreadnought or all-big-gun type -- were concerned. At that time Great Britain had thirty-three dreadnoughts now afloat; and no more are under construction. The United States had fourteen dread-naughts afloat and thirteen more either under construction or provided for under the existing 1916 three-year program. The new program, as presented by Secretary Daniels, called for the addition to the American fleet in the next three years of ten dreadnoughts, six battle cruisers and 140 smaller ships, the types and proportions of these to be determined after all the naval lessons of the war can be fully studied and assimilated. No nation had under way any additions to existing fleets of battleships of the old-fashioned type. Great Britain had twenty-nine of these, the United States twenty-five. Of battle cruisers, the type of naval vessel that combines something of the fighting power of the older battleships with the speed and radius of action of the cruiser, there were none in the US Navy as of 1919. The US had six under construction, against Britain's nine afloat and four building. The six more which the Administration's program called for would give the US twelve to Britain's thirteen, assuming the latter nation added no ships of this type in the meantime. Of first-class cruisers the US had twelve to Britain's thirty; the US had under construction ten scout cruisers and had afloat twenty-nine light cruisers, while Britain had eighty-nine of the latter in the water and fifteen more building. The six-year program of the Navy General Board, for which Mr. Daniels wished to substitute the three-year program, called for thirty more scout cruisers. Under the Administration's program a considerable proportion of the 140 unarmed types of ships to be built will doubtless be cruisers. No small part of the $600,000,000 which the Secretary of the Navy asked Congress for blanket authority to expend in the next three years would be used for destroyers and submarines. General Board's six-year program called for 233 new submarines and 108 more destroyers. With the ninety-two destroyers afloat in 1919 and the 238 under construction, this would give the US 438 destroyers by 1925, while Great Britain would have 516 when the 107 then building were added to the 409 in commission. The US had eighty submarines in service to Britain's 140; and was building ninety-nine more, Britain eighty-two more. France had thirteen battleships of the old type, twenty-one first-class cruisers, eight light cruisers, ninety-one destroyers and sixty-two submarines, and these, with minor coast-defense and auxiliary craft probably would constitute its entire, naval strength for a considerable time ahead, in view of the condition of national finances. Italy had projected four more dreadnoughts to add to its five in existence. Like France, it was hardly likely now to go in for important naval increases, and its existing dreadnoughts, with its nine battleships seven first-class cruisers, ten light cruisers, forty-two destroyers and seventy-five submarines may be regarded as constituting Italy's naval strength for the next five years, at least. Japan alone, of all the nations except Great Britain and the United States that can be regarded as important naval Powers, is in a position to develop and carry out a programme of new naval construction on any considerable scale. Japan's fleet, for offensive purposes, contained five dreadnoughts, eight battleships of the pre-dreadnought class, seven battle cruisers, ten first-class cruisers, sixteen light cruisers, sixty-six destroyers and sixteen submarines. Her program as announced called for the building of six more dreadnoughts, two more battle cruisers, seven more light cruisers, twenty-three more destroyers and twenty-seven additional submarines. With these additions to her navy, it cannot be denied that Japan could send aformidable Armada against any other Power. Counting her seven battle cruisers as fairly equivalent to the old-type battleships, Japan already possessed an offensive power on the sea equal to that of France and, with the disappearance of Germany as a naval factor, greater than that of any other nation except Great Britain and the United States. With her announced program completed, she would excel France at every point except that of submarines and will hold beyond question the position of third naval Power of the world. The United States, the one nation that stood as the foremost advocate of a League of Nations, was the only nation that had moved, since the signing of the armistice, in the direction of increased armaments, and this at a time when the whole world was looking toward a reduction of armaments, or, at least, hoping that the Versailles Conference would establish an entente cordiale that will make possible an end to the era of competitive armaments. One purpose behind the advancement of the new American naval program was that whatever appropriations were to be made for naval expenditures for the next fiscal year, beginning July 1, 1919, must be made before the termination of the present Congress, on March 4, 1919. If appropriations are not so made, no money whatever can be spent except for the carrying out of the remainder of the present three-year program of 1916 until the next Congress met and authorized it. The new program, then, was to be taken as a maximum proposal necessarily submitted in advance of possible action by the Peace Conferees that may make naval increases unnecessary; it was a program that can be abandoned in whole or in part, as circumstances may dictate. Indeed, the 1916 three-year program, uncompleted as of 1919, may be abandoned at any time, for the Naval Act of 1916, under which it was being carried out, contains the unique and unprecedented provision that if "peaceful determination of all international disputes shall render unnecessary the maintenance of competitive armaments . . . such naval expenditures as may be inconsistent with the engagements made in the establishment of such tribunal or tribunals may be suspended when so ordered by the President of the United States." It was already apparent in 1919 that efficient combat aviation operations with the fleet depended on the use of landplanes operating from aircraft carriers. That year, Congress appropriated $690,000 for the conversion of the old collier USS Jupiter into an experimental aircraft carrier. The conversion began immediately, but was not completed until March 1922, whereupon the vessel was rechristened as the USS Langley - the U.S. Navy's first aircraft carrier.